Doing a recce for a walking tour in the King’s Cross area, I stumbled across a wonderful street food market in Granary Square and decided they had the perfect food truck for the next letter on my Foodie A-Z – G for Greece and The Grilling Greek. The street food market is operated by KERB, who launched their innovative and tasty business in King’s Cross in 2012, and now operate in various locations across London, as well as providing catering to events and functions. KERB’s philosophy encompasses four key elements; amazing food, talented people, professional practices, and transforming city spaces. And The Grilling Greek fits the bill perfectly as one of their traders. They were the first food truck to start offering Greek food in London, and they’ve been cooking up their family recipes since 2013. The Grilling Greek’s blue and white food truck stood out amongst the other street food traders, who were serving an array of cuisines – Italian pizza, Vietnamese noodles, Jerk chicken, Taiwanese rice bowls. But it was the temptation of a Greek souvlaki, and the letter of the alphabet, that swayed me. The menu consists of simple freshly cooked Greek food that really does remind you of holiday evenings lazing in local tavernas, minus the ouzo. No alcohol here, as this is all about delicious street food for a quick and tasty lunch, where you can choose from a chicken, pork or halloumi souvlaki served in a handmade pita with tomato, red onion and ‘Mama’s’ tzatziki. You can get side orders of chips and Greek salads, but the souvlaki’s looked pretty generous so I opted for just the chicken souvlaki. The guys on the food truck were friendly, but confused me by asking if I wanted it to take away or eat in??? I mean, it’s a food truck……outdoors???? Clearly this was street food code (not something I’m overly familiar with to be honest), as they laughingly clarified by asking whether I wanted the souvlaki fully wrapped (to take away / back to the office) or half-wrapped (to eat in / now). They did have a blue metal table and two chairs just by the truck, but there are plenty of places to sit in Granary Square and along the nearby Regent’s Canal, and it was a sunny day so I took my souvlaki and found a spot near the water feature known as 1,000 Squirts. The souvlaki was good, really good. The pita was soft and warm, the chicken moist and the tzatziki sauce just oozed out (I even managed to drip some down my front!). Delicious and filling, as I sat in the sun I could almost have been in Greece (if I’d closed my eyes and ignored the noise and bustle of local office workers and the students from Central St Martins art and design college). And at only £6, it was great value for money too. You’ll find The Grilling Greek at KERB King’s Cross, which operates Wednesday to Friday weekly, or at one of the other KERB locations. Traders change location from day to day, so check the website (www.kerbfood.com) to see where they’re going to be. As for me, I’ll be visiting KERB and The Grilling Greek again, and plan to try another of their street food traders – although it’s a little while until I get to V for Vietnam! Catching up after doing my alphabet a little out of order, so started looking for Egyptian restaurants to try – found loads across London with typical names such as Alexandria, but Flying Pie caught my eye. Located in between Covent Garden and Leicester Square, I popped in for a quick lunch and what a treat I discovered. I know the name doesn’t sound very Egyptian, and they only serve one type of food, pie, but it was definitely not one to miss. Now these are not pies in the British sense and the best way I can describe them is a cross between a pie and a pizza (although apparently pizza was invented a long time after these). These pies are feteers, which roughly translates as ‘cushion pies’, and they are flaky layers of pastry stuffed with either a sweet or savoury filling. A symbol of hospitality in Egypt, and often offered to guests, feteers originated in ancient Egypt and were also often left at temples as gifts to the gods. According to Flying Pie’s menu, which helpfully gives on overview of the history on the reverse, the recipe to make feteers travelled to ancient Greece, where the Greeks made their own version of these pastries. They then travelled to the Romans who apparently gave the recipe to the Persians and somehow it found its way to France, as it’s said to be the forerunner to the croissant, with the Italian pizza being a much more modern creation. At Flying Pie you can have a vegetarian pie, minced beef pie, salmon pie or, as I did, a grilled chicken pie, as recommended by the delightful waitress who said it was their best seller. Whilst waiting for my pie to arrive, I scanned the lovely little restaurant. Situated on the corner of New Row and Bedfrodbury (just around the corner from Leicester Square tube station), the light floods in through the windows into this airy restaurant. It’s only small with only 11 tables (mostly seating two, but one large enough to take a group of six), with model bi-planes and hot air balloons hanging from the ceiling and propeller blades adorning the walls. The waitress continues the theme by being dressed in a flying suit with an airman’s cap on her head. One of the best things about this tiny restaurant is that it has an open kitchen – so you can watch the cook make the pies / feteers, and that’s a spectacle in itself, especially as the lovely cook was quite happy to let me take pics while she made a pie and answered all my questions about it. First the pastry dough is rolled out onto the counter until it’s so thin you can almost see through it, it’s then trimmed into a long rectangular shape and cheese (cheddar according to the cook) is scattered in the centre, along with the chosen filling and a little more cheese on top. Then the ends are folded over to create a square, it’s placed in a square baking tray and popped into a ‘pizza-style’ oven for about 5-10 mins, before being placed on a wooden serving board and cut into squares – check out the photos below to see the whole process. My grilled chicken pie arrived steaming and, when I bit into it, oozing with the cheesy filling. The pastry layers are crispy, so it’s not as doughy as even a thin crust pizza, and at £9.50 it was a tasty, filling, good value meal. To be honest, you could have one between two, which is what the couple at the next table did – the staff don’t mind and even brought them a spare plate. And if you can’t finish, they’ll offer to box the leftovers up for you to take away! It’s probably not good for your waistline, and I certainly didn’t have room for a dessert pie afterwards (powdered sugar, honey and cream, Nutella or Nutella and banana) – good excuse for a return visit though! This is a quick and tasty lunch venue, where you can also order takeaway, and, having discovered this tasty dish, well, you can keep your pizza – it’s feteers or Egyptian pies for me. For those of you paying attention, you will realise that I’ve skipped the letter E. Fear not I’ll cover that next week. Now I know the plan was to do all the countries in order, but my godson and his partner really wanted to join me on my London Foodie journey and, as it was his birthday treat, he chose to do France. I pushed the boat out a little, as it was a special occasion, and we met for dinner at Mon Plaisir (www.monplaisir.co.uk) in Monmouth Street. This is London’s oldest French restaurant, established in the 1940s, and still serving fine French cuisine today. When you enter you feel like you are in a Parisian restaurant – the décor is French, the menus are in French, and the staff are, well, French! We were seated at a table in the area they call ‘Next Door’, because over the years the restaurant has extended into the property next door. There’s also the Front, the Back and the Upstairs. Drinks were ordered, and I enjoyed a Kir Royal while we studied the extensive menu. A basket of French bread was brought and we ordered a bottle of Picpoul du Pinet, a crisp white wine from the Languedoc region. That slipped down very easily over the course of the meal, so easy that we ordered a second bottle (well, it was a celebration). Deciding to be adventurous, and having never had them before, my starter of Cassolette d’Escargots (snails cooked in garlic, Ricard and parsley butter) arrived. Thankfully, the snails arrived without their shells – phew, no ‘Pretty Woman’ moment for me (who can forget the horror of Julia Roberts flicking a snail out of its shell and across the dining room!) My ‘slippery little suckers’ were lovely (and not slippery at all) and I mopped up the sauce with a chunk of bread. My dining companions enjoyed their starters of Poëlée de St Jacques, et Purée de Potimaron (pan-fried scallops with butternut squash puree) and Crottin de Chavignol Chaud en Feuille de Brique, Chutney d’Oignons Rouges (warm goat’s cheese in filo pastry with red onion chutney). For my main course, I went for a classic Poulet Façon Coq au Vin Maison, Pommes de Terre Vapeur (Coq au Vin with boiled potatoes). I have to say that the boiled potatoes sounded a little bland and a bit British to me, so I swopped them out for a side dish of Gratin Dauphinois. It arrived in a mini casserole dish, bubbling away, and looked amazing. The chicken just fell off the bone and the sauce with its baby onions was fabulous, and I’m glad I went for the Gratin Dauphinois, as the creamy potatoes complimented the dish perfectly. The boys had ordered the same main course, and really enjoyed their perfect pink duck breast but I think they were a little envious of my hearty meal, which was too much for me, so my godson helpfully polished it off. Our desserts arrived – well it would have been rude not to, and if there’s chocolate on the menu then I’m happy! My Fondant au Chocolat (chocolate fondant with passion fruit sorbet) just melted in the mouth and my godson loved his traditional Crème Brulee. Mon Plaisir is not the cheapest French restaurant in town (although it does do a reasonably priced pre-theatre menu), but I felt we had good value for money and enjoyed a lovely evening with delicious traditional French food served in a relaxed atmosphere by friendly and courteous staff. As the French say, Mangez bien, riez souvent, aimez beaucoup (Eat well, laugh often, love abundantly). Bon appetit! Next up on my culinary journey around London saw me heading to Ladbroke Grove and Danish restaurant, Snaps + Rye, for lunch – a delightful piece of Scandinavia tucked just around the corner from Portobello Road Market. Seated in a corner table at the back of the restaurant, I couldn’t decide what to drink. The Danes aren’t exactly known for their wines, and (where possible) the idea is to try a traditional drink. Looking at the akvavits, I felt it was a little early for a snaps (a shot), so was considering a longer drink with one of the akvavit cocktails. They had great names such as Bloody Viking, Blushing Dane and Freya’s Kiss, but couldn’t decide so sought guidance from the lovely waitress who suggested I did have a snap and ‘do it the Danish way’ by sipping it throughout my meal. Taking her recommendation, I ordered a Green Dill Weed (trust me, it was a lot nicer than it sounds) and she brought me the cutest little glass and then filled it right to the top (literally), so that I had to lean forward to take the first sip. Well, I didn’t want to lose a drop by picking the glass up and spilling it! Apparently, that’s the Danish way too; mouth to glass rather than glass to mouth for the first sip or two. As the first sip hit the back of my throat the alcohol kicked in but, as the waitress said, the second sip tastes better as your taste buds open up. My main course of pork and veal frikadeller (meatballs) arrived and I tucked in. Meatballs can sometimes be a little dry, but these were plump and moist, and set off nicely by the baby hasselback potatoes and red cabbage with bacon bits. The waitress was also right about the snap going down well when sipped slowly with the food. Oh, and it is a snap and not a schnaps. The snap selection brand, Lovlos, is the Danish restaurant owner’s own creation and each one was ‘born’ in Copenhagen, but made in London under the sub-heading ‘Danish in Spirit’. Ensuring I left room for dessert, I ordered the Gammelsdag Aeblekage. Like most of the menu, my dessert was a modern take on a traditional Danish recipe – a ‘cake’ of smooth apple compote offset with creamy, sweetened Skyr and dusted with chocolate shavings and mazarin (marzipan) crumbs. Absolutely delicious. My lunch was lovely, the surroundings relaxing, and the staff incredibly friendly. You also get value for money, as the table next to me had ordered the salmon and the waitress apologised that the pieces were smaller than usual, so she was willing to offer them either a free drink or a side order of smoked salmon to make up for it. Now, when do you hear that in a restaurant? In London? Must be the ‘Danish way’! For my third foray into London’s world of food, I decided to go back in time and revisit a Chinese restaurant that I last frequented over 20 years ago – Wong Kei’s on Wardour Street. Wong Kei’s is a legend in Chinatown and many a Londoner will regale you with their tale of eating there. The food was always good and the prices cheap, but what Wong Kei’s was well-known for was its brusque service – actually scrub that, its rude service! The waiters would always bark at you and woe betide the lunchtime diner who couldn’t make up their mind what they wanted to eat. As I headed towards it through Chinatown and the array of Chinese restaurants and supermarkets that pack the streets in this part of London, I remembered back to my days working in an office near Piccadilly Circus and my regular visits for a quick and cheap lunch. Would the food be as good as I remembered, and would the waiters still be as brusque? Or was it all just a fond memory and would I be disappointed?? It looked the same from the outside and I was quickly reassured as I walked through the door, was pounced on by a waiter and was told “You share tables. Sit there”. Doing exactly as I was told (you don’t argue with the waiters here) I took the end seat on a long table that already had six people seated at it. Service is quick – I hadn’t even sat down before a pot of green tea was delivered to my place, and as I sat another waiter barked “you know what you want?” Nope, I didn’t, although many of the other diners were clearly regulars and ordered off the top of their heads as they took their seats. I perused the extensive menu and decided to have what I always used to have when I ate here 25 years ago; chicken and sweetcorn soup followed by sweet and sour prawns with egg fried rice. As I ordered, the waiter reminded me “cash only yeah”. Yep, I remembered that about Wong Kei’s, so had ensured I had cash in my purse. The place had changed a little from my memories. I remembered it being dark inside and a little run-down and shabby, whereas today it was bright and clean with large mirrors on all the walls to give the illusion of more space. The formica-topped tables were cleaned over between customers with a quick wipe of a damp cloth, and customers were in and out all the time – a mix of regulars, local office staff, and tourists. My chicken and sweetcorn soup arrived, piping hot. So hot in fact that I burnt my tongue on the first spoonful, but it was delicious with a decent amount of shredded chicken meat in it. Before I’d even got half way through it, the main course arrived – they serve quick here and you certainly don’t wait. The man next to me got his main dish before his soup starter, at least mine came the right way round! My main was a plate of juicy prawns in crispy batter with a tangy sweet and sour sauce full of chunks of onion, peppers and pineapple. The egg fried rice was light and not too sticky, complementing the sweet and sour perfectly. And, of course, all served on melamine plates with melamine chopsticks – no china and no knives and forks here. You use chopsticks, or you don’t eat! You don’t come to Wong Kei’s for fining dining and silver service. Nor do you come here for a leisurely meal – I was in and out within 30 minutes! It’s quick, it’s bustling, it’s reasonably priced, it’s delicious, and 25 years on, it hasn’t lost its touch. I loved it! What more could you ask for from a Chinatown legend?? Continuing my journey through London’s culinary delights, this week I sampled Brazilian cuisine at Rodizio Preto on Shaftesbury Avenue. The restaurant is a typical churasscaria, where skewered meat is barbequed or spit-roasted and served by waiters called Passadors at your table. These Passadors learn the skill and art of carving the succulent meats from the skewer directly onto your plate – as much or as little as you want. Churrascarias are found all over Brazil, but the tradition comes from the Gaucho culture of the south, where cowboys would cook meats skewered on metal spits over hot coals, seasoned simply with rock salt. The prime cut of meat now associated with this style of cooking is picanha – rump steak, which has a thick layer of fat ensuring the charred, smoky meat just melts in the mouth. This fun restaurant captures the vibrancy of Brazil with its colourful interior of blues, reds and yellows. Tables are plain wood with painted wooden chairs and the large restaurant is airy and bright. The cocktail bar is well stocked, and the atmosphere is lively (but not too loud). My friend and I were early for our reserved table, but that was no problem at all for the helpful and friendly staff. The menu is a set price for the Rodizio meats and includes the salad bar. So, we grabbed our plates and explored the delights on offer. In addition to the usual salad items of sweetcorn, tomatoes, green beans, pasta etc., there are also Brazilian dishes to enjoy, and I piled my plate with helpings of Feijoada (black bean and pork stew), Pao de Queijo (cheese bread – look a little like dough balls) and Banana Frita (fried bananas). Sitting back down, the Passadors were generous in offering delicious skewered meats at our table and a steady stream of beef, chicken, lamb, pork and sausages were served. So constant is the offer of freshly cooked meat that is then carved onto your plate that it can spoil the atmosphere of a relaxed meal – until you learn why each diner is given a red and green card. Leave it on the green side and the passadors know, that like Charles Dickens’s Oliver twist, you want ‘More Please’. Turn it to the red side and you indicate ‘I’m Full’, so the waiters know whether or not to keep bringing more meat. That way you can slow the meal down to a more relaxed pace. The pork ribs just fell off the bone, the lamb melted in the mouth and the beef was cooked to perfection. Between us, we tried a bit of everything until we were full to bursting and turned our cards ‘Red’! With no room for dessert, although the tray that was offered to a neighbouring table looked amazing with its Brigadeiro (a chocolate concoction), cheesecakes and Quindims (a baked custard pudding), we paid our bill and toddled off to the underground. Preto is a small chain with a few branches across London and a couple in Essex and Surrey (www.preto.co.uk), and well worth visiting for a good value ‘eat as much as you like’ meal – even better for us as I had downloaded a special 2-for-1 offer from their website. Perhaps not really the place for vegetarians, so go if you’re a meat lover – and wear a loose waistband!! So You Think It’s Cold??? As I sit on my sofa snug in my onesie watching the snow fall outside because, let’s be honest who wanted to do a Roman Londinium walk this morning anyway (?! ), I’m thinking back to the days of much colder winters when the River Thames would actually freeze over! We think it’s cold today, but between the 12th and early 19th centuries, the Thames would regularly freeze and, Londoners never being one to pass up an opportunity, held frost fairs on the frozen river. These were great festivals of entertainment when virtually anything would go – think Hyde Park’s Winter Wonderland, but on ice. There would be stalls selling food and drink, people roasting ox or suckling pig, and beer tents. You could visit a tavern booth and drink mulled cider or wine, ale, whiskey, even tea, coffee and hot chocolate. People would ice skate, take a ride in boats on wheels dragged by horses, and watch bear baiting. Musicians and actors would perform, jugglers and fire-eaters strolled around, and it was very popular to buy a pamphlet that had been printed on a press set up on the icy Thames, or a souvenir labelled ‘bought on the Thames’. Today, it’s hard to imagine how the Thames could freeze solid, but the old medieval London Bridge had 20 arches on the river and these diminished the flow of water, meaning that the water upstream from the bridge flowed more slowly – so it could freeze. At its deepest, the ice could be 11 inches (about 28 cm) and, at the last frost fair in 1814, an elephant walked across the river! For the watermen, trade declined as they couldn’t ply their normal trade transporting people across or up and down the river, so they took to guarding the slipways and, rather enterprisingly, charged people to enter the frost fairs. The freeze had a major impact on the port of London too, as the ships couldn’t get in or out. Of course, the fun of the frost fairs occasionally took a different turn as people slipped on the ice and broke bones, and sometimes the ice cracked and they would fall through into the freezing waters below. But on the whole, frost fairs were fun and Londoners loved them, as did royalty who often attended. King Henry VIII was said to have travelled by sleigh on the frozen Thames. Could the Thames freeze over today? Unlikely, as old London Bridge was replaced in the 1830s and, coupled with the building of the Embankment, the river is now narrower and faster flowing. Believe it or not, it’s also warmer today by a few degrees, so the mini ice-age that we saw between the 14th and 19th centuries is unlikely to be replicated. That said, in the future maybe climate change will see us return to the days of the frozen Thames, and then we can all enjoy frost fairs again!! Life of a Guide – Review of the Year 2017! And what a year it’s been! During 2017 I delivered 6 lectures, 23 walks, numerous tours, and a variety of training sessions at The View from The Shard, the London Wetland Centre, Shakespeare’s Globe and Alexandra Palace. 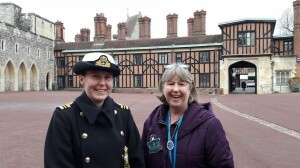 Along the way, I visited Westminster Abbey 8 times, St Paul’s Cathedral 18 times, the Tower of London 20 times, saw the Changing of the Guard at Buckingham Palace 15 times and delivered the commentary on a Thames river cruise 21 times. 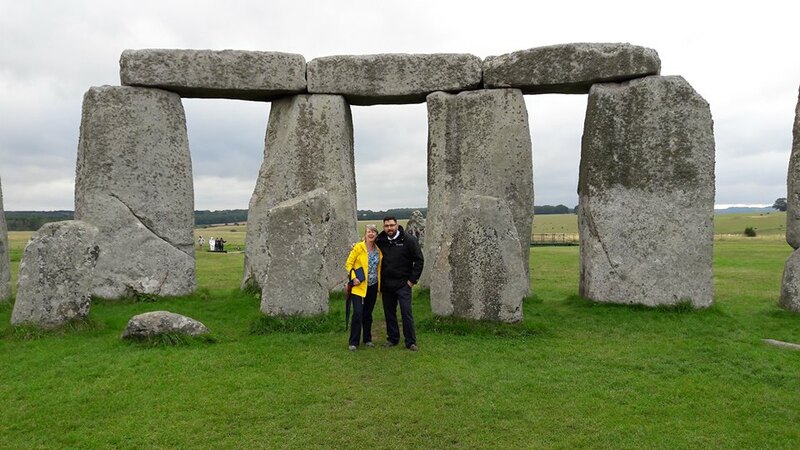 I also went to Canterbury 3 times, Stratford upon Avon 11 times, Oxford 14 times, Windsor Castle 27 times, Warwick Castle 5 times, Leeds Castle twice, Bath 48 times, Hampton Court Palace only once, and Stonehenge a staggering 50 times – 3 of those to see the sunrise! I’ve calculated that I’ve enjoyed 16 cream teas (9 in the Cotswolds and 7 at Highclere Castle), but lost count of the number of cups of tea and slices of cake I’ve had at various tearooms. So, what have been my best bits of 2017?? 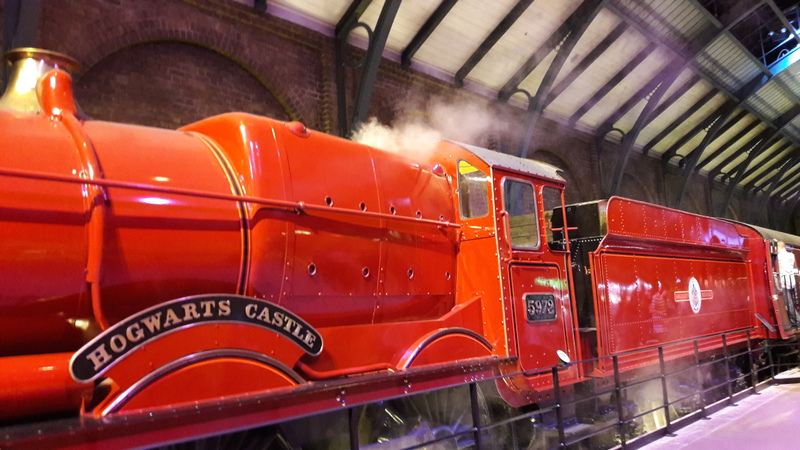 Well, in amongst all the times I got rained on, froze while queueing to get into somewhere, got stuck behind a hay tractor, and groaned as my alarm went off at 5.00am, I got paid to take a family to the Warner Bros Studios to see the Harry Potter film set. I also got paid to teach some Chinese visitors how to take afternoon tea, which I did twice in the Marriott County Hall Hotel where the staff were just delightful and the cakes divine. I’ve been on a coach which broke down, left someone behind because they were late back to the coach, and got stuck in traffic on many an occasion which meant I had to readjust the tour. Creating and delivering a series of walks on the construction and archaeology of Crossrail for the Museum of London. Ten walks across London taking in different parts of the tunnelling and stations, from Plumstead in the east to Paddington in the west, which have turned me into a Crossrail nut! 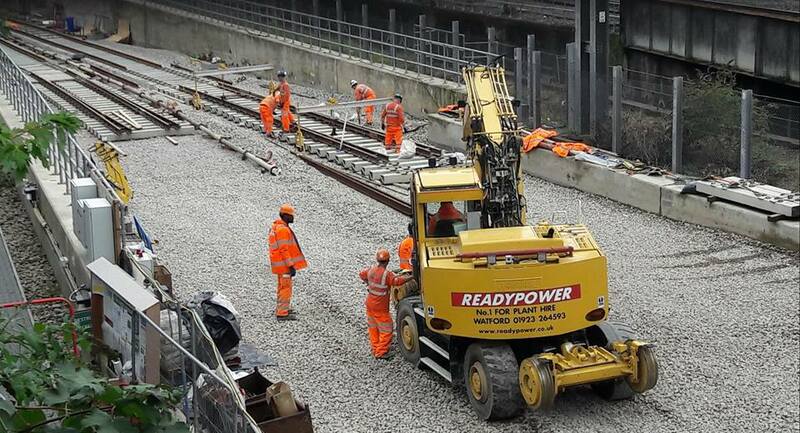 I now know tons about, and get very excited about, the tunnel boring machines, the concreting trains, floating track, uphill excavators, and station design. Getting one of my coach drivers to come up to the stone circle with me at Stonehenge to see the sunset – in all the times he’d driven groups to the ancient monument, he’d never actually been up to the stone circle before. And, although he enjoyed the experience, like most coach drivers, he still thinks it’s just a pile of rocks!! 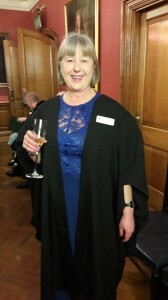 Becoming a Freeman of the Worshipful Company of Educators. A long-held aim of mine became a reality in 2017, when I was formally initiated into this livery company. 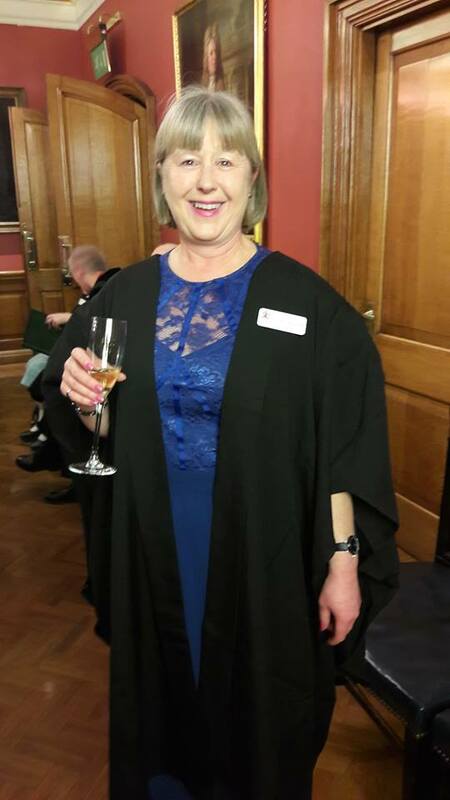 As someone whose formal schooling ended at the age of 16, and who firmly believes that education is more than sitting in a schoolroom or university lecture theatre, I am looking forward to getting more involved in their charitable work and the promotion of life-long learning. 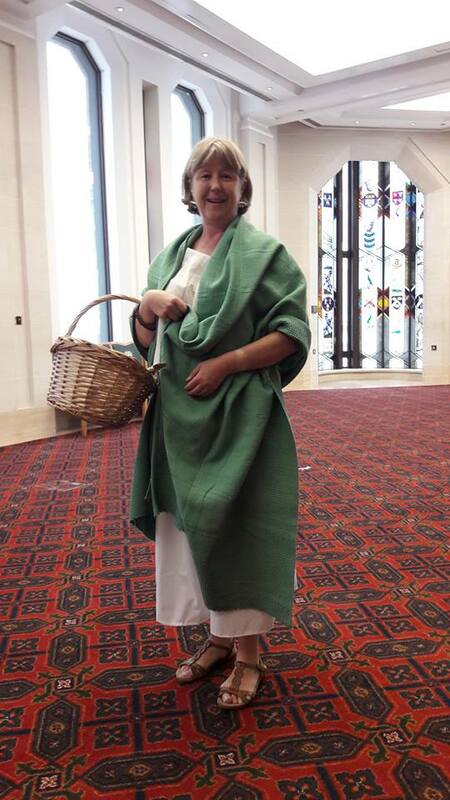 Dressing up as a Roman to lead some family friendly walks through the City of London for their Roman Londinium Festival. Having always shied away from doing walks for kids, I thoroughly enjoyed the challenge of keeping a group of children entertained whilst teaching them about life as a Roman in London in the 2nd century. We talked shopping for ingredients to make milk-fed snails, being a soldier in the Roman fort, relaxing in a Roman bathhouse, and fighting in the amphitheatre. What amazed me more than the kids’ enthusiasm, was that none of the office workers bustling around us as we walked the streets batted an eyelid at this Roman lady greeting them with calls of ‘Salve’ as we passed! 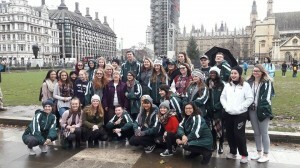 Spending three days with the Edmond Santa Fe High School Choir showing them London’s famous landmarks (even though Big Ben is completely under scaffolding?! ), Windsor Castle and Oxford. What a fabulous bunch they were – cheerful in the cold and wet, full of questions and curiosity, and unfailingly polite (not sure I’ll ever get used to teenage boys calling me ‘Ma’am’). They were just a joy to be with and will return home after the New Year’s Day Parade with fond memories of their first visit to London. Who knows what 2018 will bring, although the indications are that we are set for another bumper year for tourism. I have a number of interesting projects in their early stages (training at a military fort, walks on Roman cemeteries and funerary practices, some specialist tours at The Charterhouse to do with Crossrail), and will no doubt be seeing the rocks at Stonehenge once or twice too! 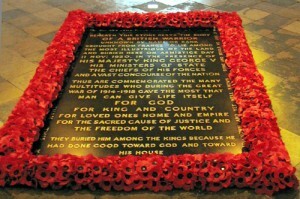 I often take visitors to Westminster Abbey, and one of the most poignant moments of any tour is when we stop at the Tomb of the Unknown Warrior. It’s visited by thousands of tourists every year, but who was he and how did his grave come to be the most important burial in the Abbey despite all the monarchs buried there? His story starts with the Reverend David Railton, a padre serving on the Western Front in World War One. In 1916 he saw a simple wooden cross in a garden marked ‘An Unknown British Soldier’. Moved by this, David Railton thought about what he could do to ‘ease the pain of father, mother, brother, sister, sweetheart, wife and friend’ and suggested the idea for an Unknown Warrior grave to represent all the dead. His letter to Sir Douglas Haig went unanswered. The idea continued to nag at him and in 1920, he wrote to the Dean of Westminster, as he considered the Abbey to be the only suitable place for the burial. The idea floundered for some weeks, until the Dean managed to get the Prime Minister on his side, and then ultimately King George V. On 18th October 1920, with just three weeks to go, it was decided that the burial should take place on Armistice Day. On 7th November, Brigadier General L J Wyatt chose the Unknown Warrior from four bodies that had been exhumed from the battlefields at the Aisne, the Somme, Arras and Ypres. Transported by ambulance to Boulogne, the road outside the town was lined with French and British troops. After resting overnight in a chapel, the remains of the Unknown Warrior were placed in a special coffin sent over to receive it and came back to Britain on HMS Verdun. Loaded carefully onto a train, it made its way from Dover to Victoria Station. Thousands of people turned out along the route to watch the train pass and pay their respects, and the roof of the carriage containing the coffin was painted white so people on bridges along the route knew which carriage he lay in. 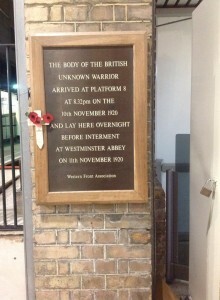 At 8.32pm on 10th November 1920, the body of the Unknown Warrior, sealed in a coffin, was brought to Platform 8 at Victoria Station. Following an overnight vigil at the station by the Kings Company Grenadier Guards, the coffin was placed on a gun carriage to be taken to Westminster Abbey. As the funeral cortege set off, a field marshal’s salute was fired in Hyde Park. The procession was accompanied by the nation’s highest ranking officers and ex-servicemen. Stopping in Whitehall, King George V unveiled the permanent stone Cenotaph at 11.00am, laid a wreath and then joined the cortege with members of the Royal Family, the Prime Minister and Government ministers. 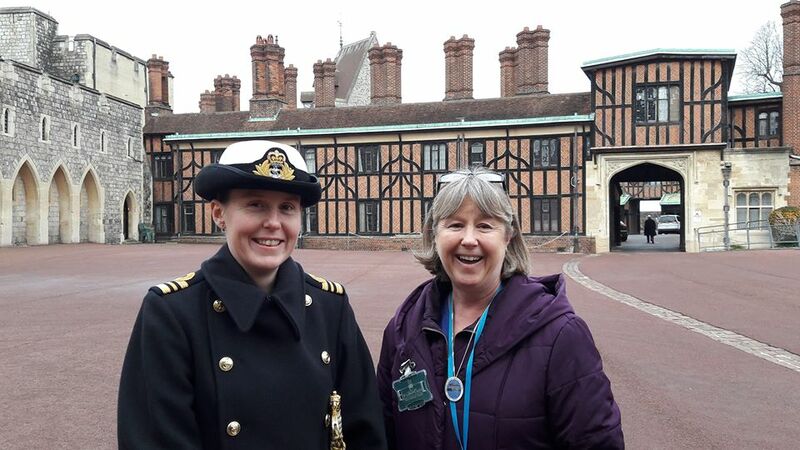 At Westminster Abbey, the nave was lined with 100 Victoria Cross recipients and in the congregation were 1,000 widows and mothers as guests of honour, including 100 women who had each lost their husband and all of their sons. The Unknown Warrior was laid to rest in the western end of the nave in a coffin made of English oak, from a tree at Hampton Court Palace. On top lay a Crusader’s sword from the Tower of London. The coffin was placed in a grave filled with soil brought from Ypres and France, covered with a slab of Belgian marble with an inscription made from shell cases. It was to become a focal point for all the unknown dead, giving every relative the hope that this was their son, brother, husband or father. 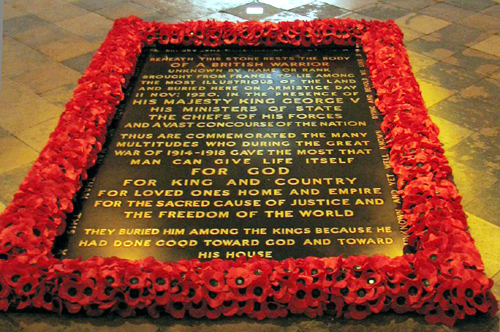 In 1923, when Lady Elizabeth Bowes-Lyon married the Duke of York (the future King George VI), she spontaneously stopped when entering Abbey and laid her bouquet on the Tomb of Unknown Warrior in memory of two of her brothers who had lost their lives in the Great War. An act followed by royal brides ever since, although their bouquets are usually laid on the tomb when leaving the Abbey or the next day. Tonight, as we enter our weekend of Remembrance, the arrival of the Unknown Warrior at Victoria Station will be commemorated by The Western Front Association, in a little known ceremony that takes place every year. At 8.00pm on 10th November at Platform 8 a parade assembles, the last post is played and a one minute silence is observed. Then wreaths are laid at the memorial plaque by members of the armed forces, the Royal British Legion, the Metropolitan Police and London Transport among others. It is a small, but significant and incredibly moving tribute, in honour of that Unknown Warrior who has no name but will always be remembered.